Paper and Ink Playground: Rubbernecker Holiday Blog Hop! It's time for the Rubbernecker Holiday Blog Hop! The Stampin’ Sisterhood is in a holiday mood. 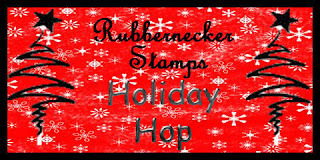 We're all using Rubbernecker Holiday images so put on your favorite CD and get ready to hop with us. 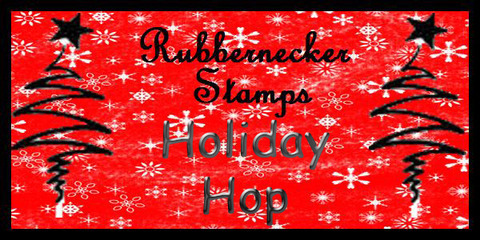 Just leave a comment at each hop site and you'll be entered in a random drawing for your choice of one Rubbernecker Stamp set. We know you're busy, so you will have until THURSDAY 11/17 to hop. The winner will be announced on the Rubbernecker Blog on FRIDAY 11/18. We have some exciting news to share as well. We will be starting some awesome Rubbernecker challenges on SUNDAY 11/20. Hope you will join us for SISTERHOOD SUNDAYS. Time to get hopping! Beautiful card!!!! I love all the different blues and the layout! My first time here....glad to meet another Charlene. Oh so pretty, Charlene :) I love blue and white for Christmas. Love the crispness of this! Very pretty I love blue for the holidays!! What a great card! I love the joy sentiment! How pretty! I love those colors together and the way you placed everything! So crisp and cool..perfect for Winter! Love the dp and the softness of the blues! Lovely Christmas Card, Charlene! Oh this is so sweet. I love the colors. It actually snowed here for the first time this season. I am so not ready for the cold winter, but I must say that your blue and white snowflake card is lovely. I like the pretty dp with the little birdie. Very pretty card,love the colors, thank you so much for sharing it. Love the colors and the simplicity of the card. Aweome layout and papers! Love the joy stamp, very pretty card! Love your sketch Charlene and the pretty blues! What sweet paper, Charlene.....your snowflakes look sooo pretty and I love the Joy sentiment...beautifully done!!!!!! Cute card. Great idea to stamp the snowflakes on dp. Love the pretty blues with white! Pretty! So pretty! I'm really liking the non-traditional colors of green and blue. Beautiful card! Love the colors! Looks so frosty! Super card, love the color combo for Christmas! One of my favorite color combos for Christmas! Gorgeous work and layout! a gorgeous christmas card with a wonderful arrangement of layers! What a cute little birdie! I love the layout and the colors! I love the blues you used with the snowflakes set! Great job! A wonderful snowflake card....with the bird in the tree, it's just perfect! Very pretty and unique with the blues. Such a pretty card--the blue and silver are wonderful colors to use in a Christmas theme, don't you think? Blue of any shade are among my favorite colors...what goes better with winter cards than shades of blue? Nothing! Beautiful card! Oh, I have the snowflake set and that paper. Might have to scraplift this. A pretty card - I love the blues! Wonderful card! Love that bird! I love the non-traditional colors you used, so beautiful! I am so excited about the challenges coming up. I have so many Rubbernecker stamps that need some inkin'! Love the card, I'm very partial to blues for holiday cards! Beautiful! Lovely card...love blue for winter cards! very pretty and I Like your setting for the card too! Love the frosty blues for a winter card. Charlene, Such a cute card, and I like the color combinations. Very nice! I just love blues for Christmas cards, and this is altogether so elegant. Beautiful card! I love that bird on the branch, such an unexpected touch. Lovely card! Makes me wish for snow! Ooooow! This is awesome!!! I am loving the colors and snowflakes! Thanks for the inspiration! Love blue Christmas cards and yours is no exception. Wonderful card! Ooooo! My favorite Christmas colors! Love the elegance yet simplicity of your card. The blue colors were a great choice. Thanks for sharing. Beautiful! My favorite color for Christmas! Great card, elegant and in our fav color! This card is so beautiful! I love the blue colors and the prettypapers as well as the sketch!